Canon already gives users of it's DSLRs the EOS Utility which allows them to shoot tethered, controlling everything except zoom from a computer. This is useful for timelapse photography or in a studio environment where you're not needing too much camera movement but want to take advantage of the ability to review shots on a larger high-res screen and save them straight onto a hard drive, especially useful if you're lucky enough to use one of the new 21megapixel Canon 5D mk2. Photoshop and Lightroom plugin experts onOne have now extended this functionality with a new iPhone and iPod Touch app called DSLR Remote which lets you wirelessly control the computer/camera combination from the phone itself. You do still need the camera to be tethered to the PC, it's not a standalone remote but I'd be surprised if we didn't start to see wifi enabled DSLRs in the future that cut out the need to use USB cables for control or file transfer and this in turn would allow something like the onOne software to communicate directly to the camera. Of course you can always use the £600 wireless transmitter and grip but for most of us this isn't a feasible option. An added bonus is that for LiveView enabled cameras the app allows live streaming, allowing you to see whatever the camera sees and almost turning it into a remote security camera while future versions of the app will also allow remote control of the video functions of the newer DSLRs. It'll be interesting to see how useful the app actually is - there's already been comments suggesting that it's a case of "hey, this is cool" rather than fulfilling a particularly pressing need but I can see a number of uses where the app will come into it's own - plus there's no denying that it's rather cool functionality that I'm determined to make work somewhere! For studio shooters who are already tethered then this probably will be useful, I can imagine the tog walking around with more freedom and being able to show the images to their model for more easily. It'll certainly be handy for self-portraits since you could recompose the shot and adjust aperture etc without walking back to the camera and the intervalometer will make it popular for timelapse photography. It's not on the AppStore yet but when it comes out I'll be getting a copy to review on here. The Professional version is expected to cost $19.99 (UK pricing not confirmed yet) for full functionality but will be offered at a discount $9.99 initially, while a cut-down Lite version will give you remote shutter triggering only for $1.99. 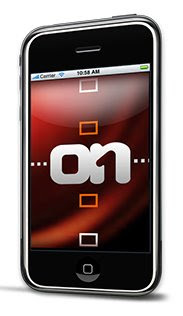 onOne will be notifying us when the app is approved via their RSS feed and on twitter from @therealmikewong. Nikon, Sony, Pentax and the others aren't supported yet but plans are to extend the app to include these brands in the future - see the onOne Q&A for a full list of supported models. Users of these brands shouldn't take this as a snub that they've gone for Canon first, I'd imagine that's due to the availability of the Canon SDK for developers.